As you could tell from my interview with Cristina Ferrare, cookbook author and host of Cristina Ferrare’s Big Bowl of Love on OWN, love is a key ingredient in her cooking. Today’s Stove-Top Sirloin Sandwiches from her cookbook are no exception. 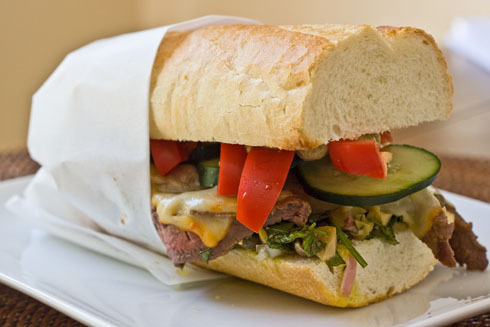 They bring together steak and cheese hot off the broiler with crisp, raw vegetables – kind of like “cheese steaks meets bánh mì“. Her daughter Alex’s salsa verde condiment ratchets up the flavor of the sandwiches several notches. It’s fabulous!Read on for Cristina’s Stove-Top Sirloin Sandwiches recipe and a chance to win a copy of the Cristina Ferrare’s Big Bowl of Love cookbook. Of course, you could very easily grill the steak and melt the cheese on your panini grill. But there’s a key benefit to preparing this sandwich just as Cristina describes in the recipe: the raw cucumbers and red peppers retain their crisp bite. If you’ve ever tried a Vietnamese bánh mì sandwich you know how fantastic that hot-cold contrast is. The salsa verde on the sandwich, with its green olives, capers, shallots and vinegar, reminds me a lot of the olive salad on a muffuletta. The bold flavors seep into the soft baguette and…mmmm…it’s an incredible sandwich. Besides the Stove-Top Sirloin Sandwiches, I’ve also tried Cristina’s Orecchiette with Broccoli Rabe and Sweet Italian Sausage, Fall-Off-the-Bone Roasted Chicken Thighs, “Best Ever” Chicken Chili, Marinated Grilled Flank Steak Fajitas and Super-Duper Double Chocolate Chip Cookies. Every dinner for a week at our house came from this cookbook, and we ate well! It was easy to cook from this book on weeknights as so many of the recipes require simple preparation. 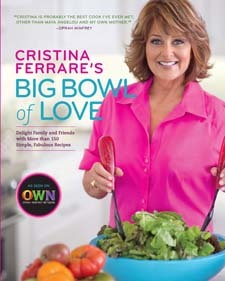 Win a copy of Cristina Ferrare’s Big Bowl of Love! Leave a comment on this post telling us the dish you make that your family loves most. The giveaway will close on Monday, June 6, 2011 at noon PDT. [THE GIVEAWAY IS CLOSED] I will use random.org to select one winner to receive a copy of Cristina Ferrare’s Big Bowl of Love cookbook and announce the winner in this post. Due to shipping costs, the prize can only be shipped to U.S. addresses. ***UPDATE 6/8/11 – Congratulations to our winner – #19, Leanna Morris! 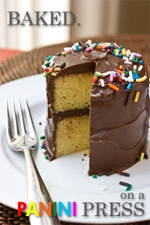 From Cristina Ferrare’s Big Bowl of Love by Cristina Ferrare. Reprinted with permission. Place all of the ingredients in a glass bowl and mix. Cover and let sit for an hour. Store in an airtight container in the refrigerator for up to 3 days. Salt and pepper each piece of sirloin. Heat an ovenproof skillet for about 3 minutes, until hot. Add the olive oil and swirl it around the pan. Sauté the cutlets for 30 seconds on each side. Transfer from the skillet to a plate to cool for 5 minutes. Cut the bread into 4 (6-inch) pieces. Slice into sandwich halves, then toast. Spread 1 tablespoon of Salsa Verde over half of the slices of toasted baguette. These will be the bottoms of the sandwiches. On the other half of the baguette slices, spread a thin layer of Dijon mustard. These will be the tops of the sandwiches. Place an oven rack 2 inches from the broiler. Turn on the broiler. Slice the meat on a diagonal into thin slices, and place back in the ovenproof skillet. Lay the cheese slices on top, and broil until the cheese begins to melt, 30 to 40 seconds. With a metal spatula, lift the beef and melted cheese and distribute among the bottom baguette halves. Layer on 4 slices of cucumber and 6 strips of red pepper per sandwich. Cover with the top baguette halves. This looks and sounds really good. I like the promise of the crunchy cucumber. The dish I make that my family loves the most is probably any kind of enchiladas. That makes them happy every time! Roasted chicken, gravy, and mashed potatos. By far the fave. What a perfect looking sandwich Kathy!! Salivating over here at 7am, lol! I make really good chicken tenders with honey mustard sauce. (@ElizabethPetry) <—-Following you on Twitter! I’m a “South’n Girl” from Texas—and I love to make KING RANCH CHICKEN CASSEROLE!! I’ve even served it when friends come over for dinner, and there is rarely leftovers!! My family loves my lasagne! It’s time to make it again! My family loves my lasagna the most! My family loves taco salad! My stuffed meatloaf – it’s always a hit! I make a barbeque meatloaf that is always gobbled down lickety-quick! I make this Indian lentil dish that my husband loves! I make delicious chicken enchiladas that everyone loves! I am also already an email subscriber! Pasta with a tomato sauce and lots of veggies is really appreciated here. With garlic bread, of course! And a big salad. Cheeseburger Casserole. Always. I swear I could make it everyday and it’d be eaten everyday as if it was the first time in years. Yum, this sandwich looks delicious. And I would love to win the recipe book. I would say that, at the moment, my family love the pulled pork sandwiches and homemade coleslaw that I make. My family loves burgers on the grill served on grilled texas garlic toast, steak fries and salad…. I make chicken tenders & my husband loves them! Oh boy, would I love this book. Everything I’ve heard from everyone who has seen it is so impressed. …And I follow you on le Twitter! My family loves french dip sandwiches from the crock pot, with the side of au gratin potatoes, it’s an easy, yummy meal! Homemade pizza’s around here. I make the crust & they pile on the toppings of their dreams. Messy, but tasty. My family loves it when I make summer salad. It is really a macaroni salad with rotisserie chicken added to make it a meal. I think my family likes my chicken soup the best! grilled cheese sandwiches on rye bread with swiss cheese! simply amazing! My husband has two favorite meals: hand-breaded fried chicken and grilled pork tenderloin. My family has different tastes. My mom loves my carrot cake. My brother loves my fruit tart. My dad only loves boiled squid and gochujang. Baked Mostaccolli oozzzing with cheese on top with Garlic Bread..and all is seasoned with LOVE! 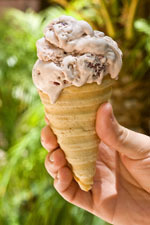 Next post: Make Your Own Ice Cream Cones…On a Panini Press!